Sunday night marked the second Advent, as well as our first Christmas dinner for the year. For many, the holidays are a time to catch up with friends and loved ones, and to reflect on the year gone by. For me, it is also a time to squeeze in as many recipes, afternoon teas, dinner parties, barbecues and lunches as I possibly can! It's only the 7th of December and this is already my second Christmas post - eeek! The savoury part of the meal was from Nigella Christmas' Come on Over chapter, which includes simple yet festive menus that you can cook when you have friends over during the holiday season. How apt! It's been ages since I'd done a full Nigella menu, or even cooked a proper meal (thank-you crazy work timetable and post-holiday blues! ), so I was very happy to be getting back into the kitchen. I eschewed Nigella's suggested dessert of chocolate-chestnut pots, in favour of more Christmassy fare. 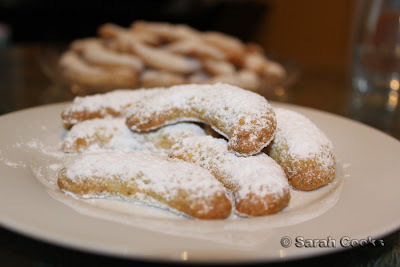 I baked my beloved Vanillekipferl, as well as some pistachio crescents. The pistachio biscuits are from How to Eat, (previously made here), and I think of them as a Middle-Eastern version of Vanillekipferl - in-keeping with the theme of the menu. The biscuits undoubtedly required a lot more time and effort than the rest of the meal, so I made them first. The Vanillekipferl recipe is here - you can thank me later. 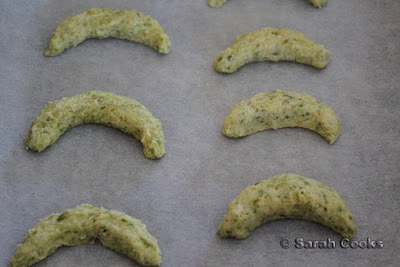 To make the pistachio crescents, I started by blanching and peeling the shelled pistachios. It's a tedious task, but it makes the finished product so much more intensely green and beautiful. 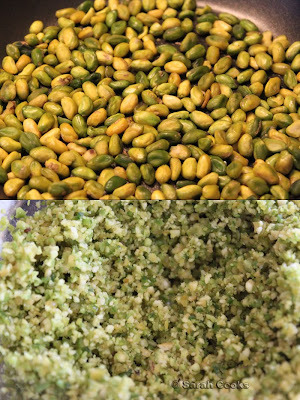 The denuded pistachios are then pulverised in a blender, and added to butter, icing sugar and flour to make a nubbly green dough. And the lovely, buttery result is that plate of biscuits you see at the top of this post. 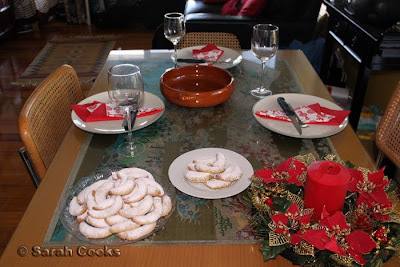 Below we have a generous plate of Vanillekipferl - the pretty plastic plate is from Balha's. It's good to make a big batch, as most of them will get eaten before you get a chance to share them. 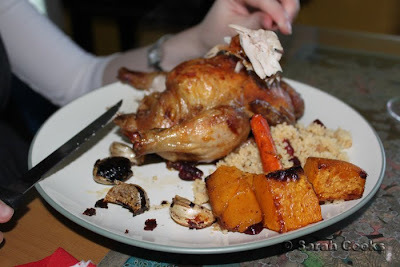 As you might expect for a Nigella menu, the dinner itself is very easy to put together. Just drizzle the chopped pumpkin with spices and oil, do the same with the unchopped poussin, stuff them with garlic cloves and lemon pieces, and put everything into a hot oven for an hour. 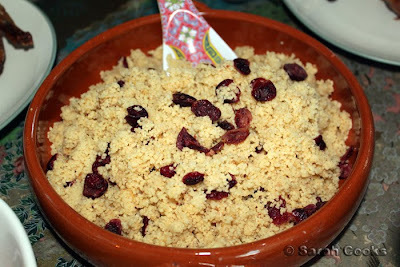 The couscous is very, very quick - all you need to do is pour hot water over couscous, cranberries and spices and wait 10 minutes. If you were organised and purchased everything in advance, I think this menu would be do-able for a midweek dinner. The low-prep, long-cook procedure gives you heaps of time to clear up the kitchen and set the table. Ta-dah! The table: check out the Adventkranz and my colour co-ordinated, cravat-folded Ikea paper napkins. When I first started blogging, I used to be very apathetic about place settings and decor, but times have changed. At the bare minimum, I like to set the table before my friends arrive, so that they know they're welcome and I'm expecting them. As I get older I plan to increase my collection of table runners, cloth napkins, napkin rings and the like, but for now I'm sticking to colourful Ikea paper napkins and my trusty brown Vue cloth napkins that my bro and his GF bought me for my bday. After about 30 minutes of roasting, the kitchen started to fill with the most delightful smell of garlicky roast chicken. 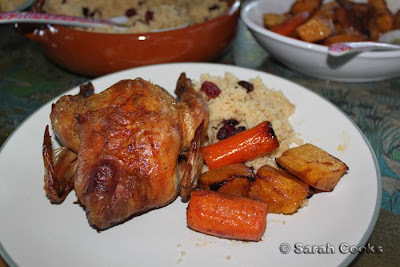 One poussin, some veggies, couscous. There is something very festive and special about getting your own mini-chicken, which, due to the high cooking temperature, was wonderfully crispy. I should add that the chickens weren't actually poussins, but were labelled as "spatchcocks", haha. Either way, the mini-chicken was both juicy within and crispy without - this is a balance I struggle with when roasting full-sized chickens. If you cook them at a high-enough temperature for the skin to get crisp, the meat can tend to dry out. The couscous - I forgot to buy coriander for sprinkling over, so it looked a bit plain, but tasted great. 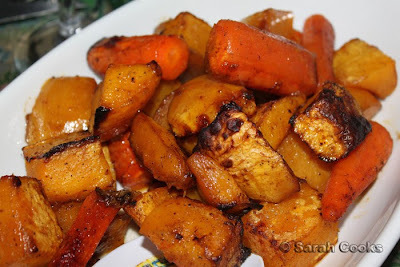 The vegetables were gorgeous - we added carrots because there were some lying in the fridge - and the heat of the oven really intensified the sweetness of both pumpkin and carrots. I was really pleased with the warm golden colours too! And that was my first Christmas dinner of the year! That looks great - and I am with you on having the table set before your guests get there! Look at all those pistachios! 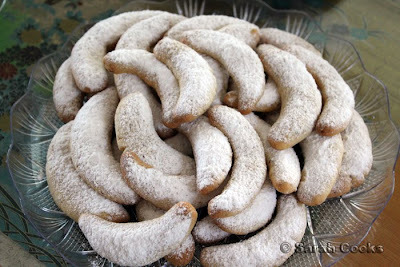 I've always wanted to try those crescents but they make me a bit nervous. Looks like a fantastic dinner...note to self: pay more attention to setting the table. Love your festive candle holder! These look good yo. Umm...are you planning on sharing some more butter filled cookies again?! I think I should crown you The Butter Queen. Seems fitting I think. Red - I *wish* I was in Bavaria! I want to go to a Christmas market!!!! imasugarjunkie - Thank-you! Well, I always used to run late when cooking for friends, so I got into the habit of setting the table early so that it doesn't look that bad when the food is an hour late, haha. Laura - Haha, I spent a *lot* of money at Ikea today on little lights and more candle holders and tealights. Inspired by Nigella's Christmas Kitchen on TV last night - all that red! And BUTTER QUEEN. I love it. LOVE IT. Oh, and Laura, the "festive candle holder" is an Adventskranz! We have to light it for each of the four Sundays leading up to Christmas. (And I'm using it as an excuse to bake each Sunday, heh). Wow - great looking Christmas feast! Looks like delicious hearty comfort food - and I love the table layout too.